A week ago, on Thursday, October 3, I received an unexpected and unintended wonderful birthday present. The Barn was prominently displayed in Bruce Bratton's column. 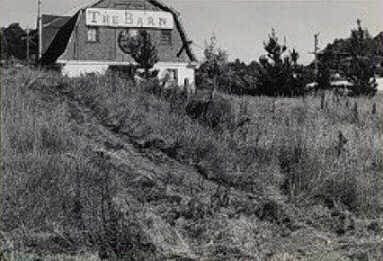 He noted that the Barn was "World Famed". It made me feel especially good since I have never met or spoken with Bruce Bratton. No ulterior motives for him to do that. If you look closely at the picture you will see that the logo of the Barn in the Good Times was not the same as the one which Joe Lisowsky, our Artist in Residence, created for us. When I bought the Barn, the Community Center was long gone. I don't know of anything that the Barn became widely known for, except for what we did there. I bought it with one purpose in mind,- to provide a launching pad for the onrushing psychedelic revolution in Santa Cruz. A place for pilgrims to warm themselves up in the storms. I had other wonderful gifts for my birthday on October 6. The City of Santa Cruz was celebrating its birthday with fireworks on my birthday! Seems like many of us got stuck on the fourth line too long. One spring day about fifteen years ago my son Ari, asked me "But dad, what have you got to show for it?" I told him "Every time I walk somewhere in Santa Cruz, some young person's eyes light up, they are so happy to see me. It revives for them the wonderful spirit that we shared there. At the end of that summer Ari said "Dad, remember what you told me in the spring? It sure was true. Every time we walked through the town, somebody stopped us with joy in their eyes." They never failed to tell us how the Barn had enriched their lives. This is my way of giving thanks where it belongs. Our whole trip was not to become famous, or to make a lot of money. We were there prepared to make sacrifices, to help each other recognize how much we could do, how much fun it was to do it. I wanted to provide a place of warmth, support and appreciation to the brave pilgrims who were thirsting for spiritual growth. We succeeded beyond our dreams. Many of us have been caught up in the storms that the new times, clashing with old powers, generated. How lucky we are to have survived and to see the fruits growing from the seeds that we planted at the Barn. Greetings fellow travellers!